An auto attendant is simply a digital receptionist that automatically routes inbound calls to different parts of a business without requiring a human interface. But when set up right, auto attendant can be a tremendous asset for any business. If you’ve ever called a business – whether a small local retail store or a Fortune 500 company – you probably heard a message like this: “Thank you for calling XYZ. If you know your party’s extension, you may dial it at any time. For sales, press one. For customer support, press two…” In the business phone system world, this feature is called an Auto Attendant. The most frustrating thing for any customer to experience when they call your business is hearing repeated ringing or being put on hold for a long time until someone can assist them. Auto attendant ensures that all inbound calls are answered in the most efficient manner possible. Besides the efficient call routing, there are other business benefits of using an auto attendant. For some businesses, auto attendant can be a much-needed cost-savings measure because it can replace the salary of having a live receptionist. 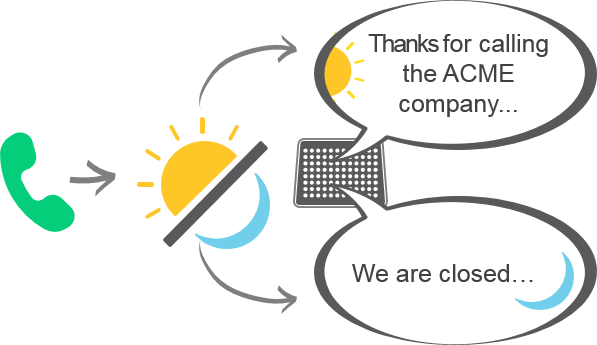 Auto attendant also allows companies to be available to customers 24/7, even when no one is actually in the office. However, most of the small-and-medium business clients we work with still prefer to offer that “human touch” when customers call in. So many opt to have a live attendant but use auto attendant as a back-up for when the receptionist is busy on another line or away from the desk. Any business that uses an auto attendant can customize it to best serve its customers and meet its operational needs. A dial option in auto attendant can go directly to a specific extension, to another submenu of options, call queues, or voicemail boxes. Some choose to have a dial option in auto attendant ring multiple extensions simultaneously until the call is picked up by the first available person. Some choose to have a dial option automatically route to a voicemail box if the extension is busy or the call is not answered after two or three rings. You can also set up your auto attendant to play different welcome greetings and route incoming calls differently based on dates/times of the week. For example, during non-business hours, your auto attendant greeting should let your customers know that your business is currently closed and re-route the call to a general sales voicemail box instead of sending them into a sales call queue. Auto attendant features included in today’s VoIP communication systems offers a lot of flexibility to meet each business’s end goal for its callers. There are a few best practices to keep in mind when setting up an auto attendant. Following these simple but important guidelines will help your callers have the most efficient, positive experience when calling your business. When you’re designing your auto attendant(s), the most crucial question you need to answer is this: “Where does each call stop?” The last thing you want is someone calling the company and getting caught in an endless loop of “press one,” then “press three,” then no one answers, then they’re back to the main menu. That’s phone system purgatory for any client or customer. In order to avoid that nightmare scenario and set up your auto attendant for maximum efficiency, you need to have a clear idea of your business requirements, available resources, and customer experience goals. Should the incoming calls route to specific departments or is there a different call route that makes more sense? If the call routes to an extension that’s busy, what happens next; does it go to voicemail or get re-routed to another extension? If the caller chooses the extension for store hours and directions, do they have to hang up afterwards or do they get an option to go back to the main menu? Thinking through the call routing details up front will ensure your customers have a pleasant and effective phone experience with your business. Having a number to press to hear the choices again or using zero to reach the operator are optional, but can help curtail caller frustration or impatience. For retailers, it’s also a great idea to have an option to hear business hours and directions. Don’t offer more than five or six initial choices if you can help it. More than that, and any callers who listen to the whole menu will forget which option they want, and will have to start over. Not a good first impression. Do list the most requested option first; “Press one for sales” is bad form if the majority of your calls are for service. But be sure to keep the options in numerical order to avoid confusion. Do reserve the “zero” key for directing a call to a receptionist/operator if you have one available. It’s the default in most phone systems, so any exception to that is going to confuse people. Don’t use the main menu of auto attendant extensions for individuals. That way, you don’t need to re-record the message every time an employee changes departments or leaves the company. Don’t feel the need to use “please” before each option. While polite, it becomes redundant and isn’t necessary in order for your message to sound professional. Do consider having a specific message for after hours, especially if you have a business that may get a lot of emergency calls (e.g. medical office). The more quickly your customer finds out you’re closed and is given an alternative option, the more positive his or her experience is going to be. Auto attendant provides a flexible, efficient way for even the smallest business to handle its incoming calls in a professional manner that leaves customers and business partners with a great first impression.